Work effectively with the Salesforce Support team to get issues resolved. Explain how to open and manage cases for the Salesforce Support team. Let’s face it, sometimes you need help fast. Enhanced Technical Support is one of the main benefits—and lifesavers—of your Premier Success Plan. It provides faster access to experts and help troubleshooting your code. As a Premier customer, you can choose to submit a support case by phone at any time, through Salesforce Help, or via live chat with an agent (when available). And remember, if you’re a DC, your case goes right to a Tier 2 support agent. Premier customers get 24x7 phone support in English. We also have Support agents in 16 locations across the globe for support in 11 additional languages. Bookmark this article now; it lists all the phone numbers and support hours for our global teams. Now, let’s see how to open a support case and learn some tips for getting help fast. When an issue arises that you can’t resolve, it’s time to head to Salesforce Help and open up a case. Let’s walk through those steps. If you’re experiencing a critical issue in your production instance that affects all users, call our tech support immediately. In our terminology, this is a Severity 1 case (more on that below). Do not try to log a case via Salesforce Help or chat. We want to start triaging this with you right away, and a phone call is the best way to do this. Click ?. Don't see a '?' in the upper right corner of the app? You're on the older Classic UI. Just click Help instead to get started. Select a topic and category for your issue so that we can route your case to the right team. The more accurate you are, the faster we can help you. Check out the list of common issues and solutions our handy mascot Blaze found for the product and category you selected. One of them can likely help you resolve your issue quickly on your own. If you still need help, click Create a Case at the bottom of the screen to select how you prefer to open up your case. Complete the Add Case Details page and provide as much detail about the issue as you can in the description field. Include links to troublesome items if possible. It’s also a good idea to go ahead and grant login access to our Support agents if you know they are will need to take a look at something in your org. This is super important and helps us resolve your issue as quickly as possible. Select a severity rating from the severity rating dropdown near the bottom of the form. Check out the definitions below. Remember, while it might feel urgent, most cases fall into the severity 3 and 4 levels. At the bottom of the screen, enter any appropriate email addresses in the Case Collaborators section. This handy feature keeps everyone informed on the progress of the case through email notifications. The primary contact and case collaborators can simply reply to any emails from Salesforce Support to add additional comments to the case. Once you’ve completed the new case form, click Submit. You can expect to hear back from an agent within the specified response times. Critical production issue is affecting all users, including system unavailability and data integrity issues with no workaround available. Let’s take a moment to talk about Developer Support, one of the most beloved services in Premier Success Plans. Our team of Support agents can give you best practices for Apex code, Visualforce pages, Lightning components, and our APIs. We can troubleshoot Salesforce error messages and performance issues, and we review up to 200 lines of Salesforce code. Creating a Developer Support case is just like creating any other support case. It’s one of the topics you can select when you create a case in Salesforce Help, and Developer Support cases use the standard response times listed above. There are, however, a few extra things to be aware of when it comes to Developer Support cases. Check out this Knowledge Article for the full scoop. You can view and manage all your cases—whether you create them via phone, chat, or online—in Salesforce Help. 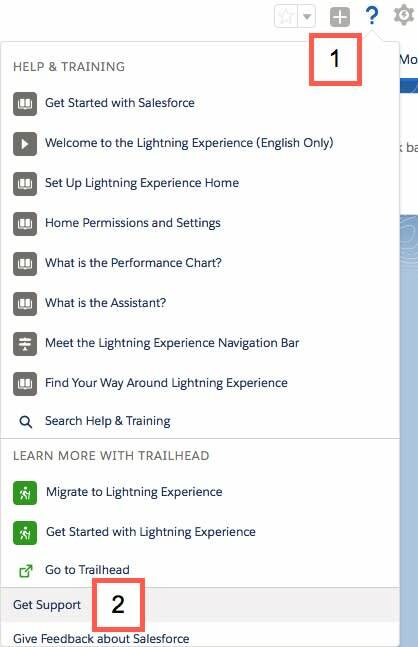 Click the View Cases link in the Support & Services tile on the Salesforce Help home page. Find your case either by using the filter button in the upper right, or the search box. Click the case to see all the details. From there you can also add file attachments, enter comments for the case owner to review, and so on. Yep, we’ve all done it—forgotten a crucial password. If that happens to you, use the Forgot Your Password? link on the login page. Enter your username to initiate the process. Voila! Note that Salesforce success agents do not reset any passwords. If you forget your username or are locked out to due multiple incorrect login attempts, contact your organization’s system administrator for assistance. Add your contact information to the login page, so it’s easy for users to get in touch. See this article for details. At Salesforce, we take pride in customer satisfaction and loyalty. If we're not meeting your expectations with case management or case resolution, let us know by escalating the case to our Technical Support Management team. Remember, only Designated Contacts can escalate a case. See the previous unit to learn more about Designated Contacts. Here’s how to escalate a case. Locate the case in Salesforce Help. If it’s gone beyond the initial response time, you’ll see an Escalate button. Click Escalate to sound the alarm. The Escalate button only appears after the initial response time has elapsed. The initial response time varies depending on the severity of your case. See the Severity Definition table above for initial response times.